Animals with venomous bites or stings. Don't mess with this bunch! © Joseph Dougherty. All rights reserved. Avicularia versicolor (Walckenaer, 1837) Martinique Bird Spider aka Martinique Red Tree Spider, Martinique Pinktoe, Antilles Pinktoe Tarantula Martinique Bird Spider, Avicularia versicolor spiderling, smaller than a US quarter with legs outstretched. 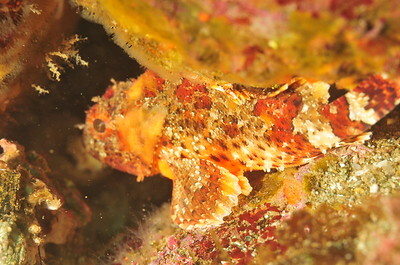 Native to the islands of Guadeloupe and Martinique. © Joseph Dougherty. All rights reserved. Avicularia versicolor (Walckenaer, 1837) Martinique Bird Spider aka Martinique Red Tree Spider, Martinique Pinktoe, Antilles Pinktoe Tarantula Martinique Bird Spider, Avicularia versicolor spiderling, smaller than a US quarter with legs outstretched. 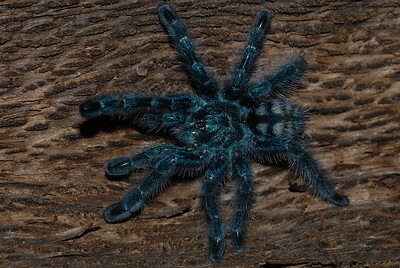 Spiderlings of A. versicolor are bright blue, with a black treetrunk pattern on the abdomen. 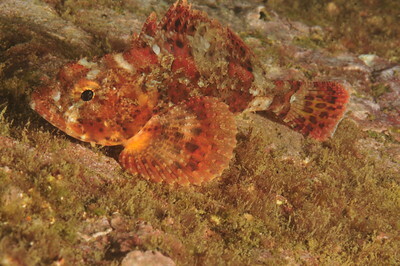 As they grow, they gradually lose the blue coloration and their carapace turns green, their abdomen red, their legs green with purple hairs and pink tarsi. 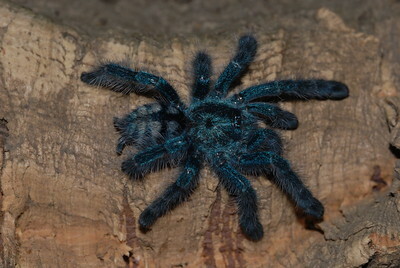 They are a more colorful version of their cousin, the Pinktoe tarantula. 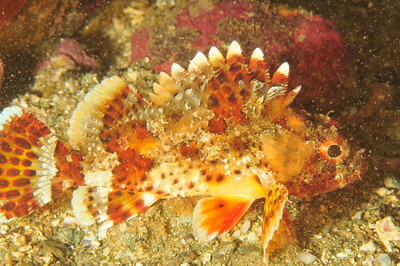 On average, males are slightly more brightly colored than females. Like most tarantulas, males stay much smaller than females- especially in the abdomen. © Joseph Dougherty. All rights reserved. Avicularia versicolor (Walckenaer, 1837) Martinique Bird Spider aka Martinique Red Tree Spider, Martinique Pinktoe, Antilles Pinktoe Tarantula Martinique Bird Spider, Avicularia versicolor spiderling, smaller than a US quarter with legs outstretched. 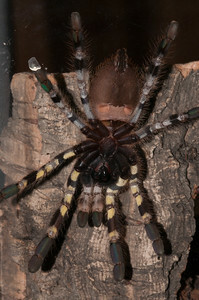 Antilles pinktoe tarantulas are arboreal (tree-dwelling). They spin elaborate funnel webs in which they spend most of their time. In captivity, cage height is much more important than floor space. Decor consists of tree branches or cork pieces to which the spider can attach its web. © Joseph Dougherty. All rights reserved. Grammostola rosea (Walckenaer, 1837) Chilean Rosehair Tarantula aka Rose Hair Tarantula, Chilean Rose Tarantula, Chilean Flame Tarantula Chilean rose tarantula guarding an egg sac. Gramostola rosea are relatively docile, low maintenance, and inexpensive, so they are popular as pets. A terrarium should be at least triple the spiders' legspan in length, with a retreat for hiding. 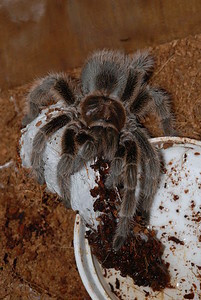 G. rosea can be kept in relatively low humidity; overflowing the water dish one or two times a week should provide ample humidity for this species. They are quite happy living at temperatures of around 25-30°C (77-86 fahrenheit), with a diet of four to six crickets every three weeks (or one locust per week). 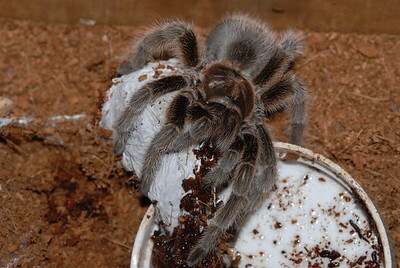 The G. rosea's feeding schedule is rather erratic, however; the spider can fast for weeks to months at a time. Fasting is sometimes an indication of an upcoming moult. Grammostola rosea are usually skittish, running away from danger rather than acting defensively, but they may also raise their front legs and present their fangs in preparation to defend themselves. They can act especially defensive for days after moulting; this may be innate in the spiders behavior. As with the majority of tarantulas from the Americas (New World tarantulas), they have small spine-like urticating hairs on their abdomen that they kick off or release when threatened as a defense. In February 2009 a British man was treated for tarantula hairs lodged in his cornea. 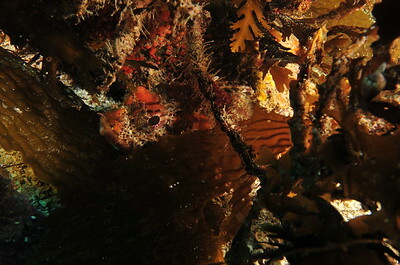 The hairs were thrown from the man's pet G. rosea while the man was cleaning its tank. Medical authorities urge owners to wear protective eyewear when handling a G. rosea. Keeping in mind that urticating hairs can cause medical problems, handling the tarantula is not a concern if handlers wash themselves afterwards and remain cognizant of the hazards. © Joseph Dougherty. All rights reserved. Grammostola rosea (Walckenaer, 1837) Chilean Rosehair Tarantula aka Rose Hair Tarantula, Chilean Rose Tarantula, Chilean Flame Tarantula Chilean rose tarantula Grammostola rosea creating a silk mat outside her burrow before laying an egg sac. Note the fullness of her abdomen. © Joseph Dougherty. All rights reserved. Grammostola rosea (Walckenaer, 1837) Chilean Rosehair Tarantula aka Rose Hair Tarantula, Chilean Rose Tarantula, Chilean Flame Tarantula Chilean rose tarantula creating a silk mat outside her burrow before laying an egg sac. The Grammostola rosea has been bred in captivity for years either for research purposes or for trade. 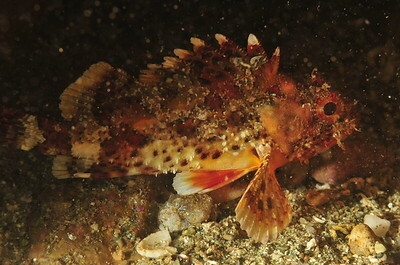 Females profit from a ‘cooling period’ of a couple of months preceeding introduction of a male for mating. Once a male has reached sexual maturity he will create a sperm web before he is introduced to the female’s terrarium. He will eventually approach the female’s burrow with caution, tapping and vibrating his legs to attract her out of her shelter. At the opportune moment the male will lunge himself forward and using his hooks he will hold the female's chelicerae, pushing his mate into a vertical position giving him access to the female’s epigyne (external genitalia). The male will insert one (or even both left and right) pedipalp into the female's epigyne and inject the fertilizing fluid. 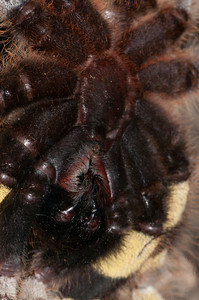 In the weeks following fertilization, the female produces a large egg sac (usually containing around 500 spiderlings). © Joseph Dougherty. All rights reserved. Grammostola rosea (Walckenaer, 1837) Chilean Rosehair Tarantula aka Rose Hair Tarantula, Chilean Rose Tarantula, Chilean Flame Tarantula Chilean rosehair creating a silk mat outside her burrow before laying an egg sac. 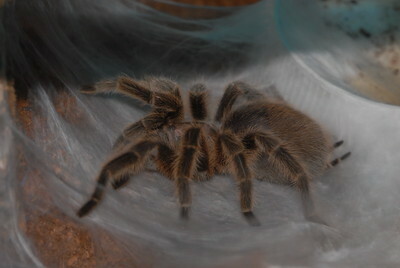 G. rosea is a common pet of tarantula rearers. Females have been known to live as long as 15–20 years, but due to the limited time they have been available on the market (and hence for extensive study) it is possible that they may live considerably longer than 20 years. © Joseph Dougherty. All rights reserved. 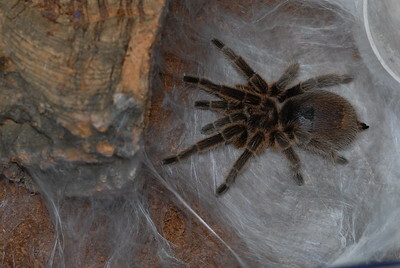 Chilean rose tarantula Grammostola rosea creating a silk mat outside her burrow before laying an egg sac. 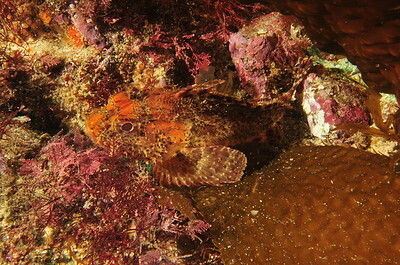 Note the fullness of this female's abdomen. 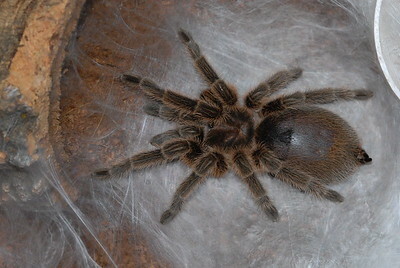 The Grammostola rosea has been bred in captivity for years either for research purposes or for trade. 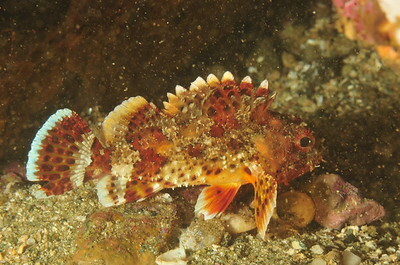 Females profit from a ‘cooling period’ of a couple of months preceeding introduction of a male for mating. Once a male has reached sexual maturity he will create a sperm web before he is introduced to the female’s terrarium. 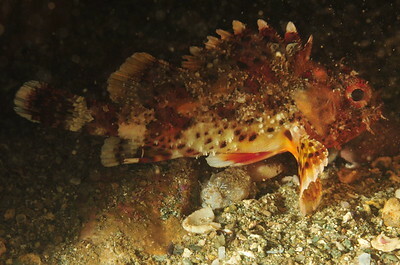 He will eventually approach the female’s burrow with caution, tapping and vibrating his legs to attract her out of her shelter. At the opportune moment the male will lunge himself forward and using his hooks he will hold the female's chelicerae, pushing his mate into a vertical position giving him access to the female’s epigyne (external genitalia). The male will insert one (or even both left and right) pedipalp into the female's epigyne and inject the fertilizing fluid. 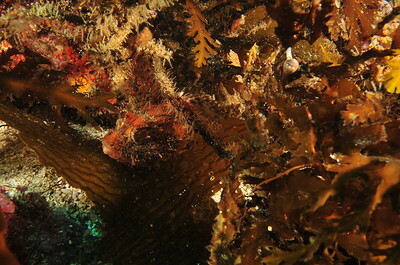 In the weeks following fertilization, the female produces a large egg sac (usually containing around 500 spiderlings). © Joseph Dougherty. All rights reserved. Grammostola rosea (Walckenaer, 1837) Chilean Rosehair Tarantula aka Rose Hair Tarantula, Chilean Rose Tarantula, Chilean Flame Tarantula Chilean rose tarantula Grammostola rosea guarding an egg sac. © Joseph Dougherty. All rights reserved. Grammostola rosea (Walckenaer, 1837) Chilean Rosehair Tarantula aka Rose Hair Tarantula, Chilean Rose Tarantula, Chilean Flame Tarantula Chilean rose tarantula guarding an egg sac. She is positioned beside her water dish inside her terrarium. © Joseph Dougherty. All rights reserved. Grammostola rosea (Walckenaer, 1837) Chilean Rosehair Tarantula aka Rose Hair Tarantula, Chilean Rose Tarantula, Chilean Flame Tarantula Chilean rose tarantula guarding an egg sac. © Joseph Dougherty. All rights reserved. Chilean rose tarantula Grammostola rosea guarding an egg sac. Gramostola rosea are relatively docile, low maintenance, and inexpensive, so they are popular as pets. A terrarium should be at least triple the spiders' legspan in length, with a retreat for hiding. 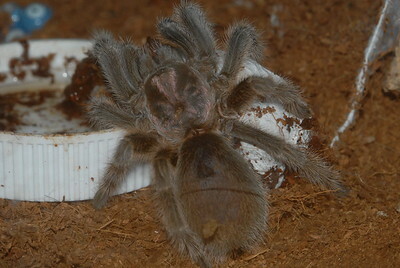 G. rosea can be kept in relatively low humidity; overflowing the water dish one or two times a week should provide ample humidity for this species. They are quite happy living at temperatures of around 25-30°C (77-86 fahrenheit), with a diet of four to six crickets every three weeks (or one locust per week). 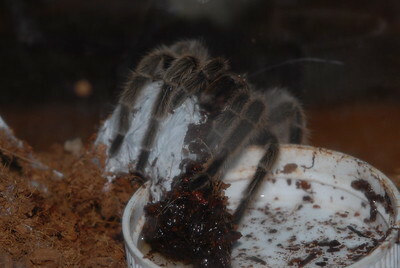 The G. rosea's feeding schedule is rather erratic, however; the spider can fast for weeks to months at a time. Fasting is sometimes an indication of an upcoming moult. Grammostola rosea are usually skittish, running away from danger rather than acting defensively, but they may also raise their front legs and present their fangs in preparation to defend themselves. They can act especially defensive for days after moulting; this may be innate in the spiders behavior. As with the majority of tarantulas from the Americas (New World tarantulas), they have small spine-like urticating hairs on their abdomen that they kick off or release when threatened as a defense. In February 2009 a British man was treated for tarantula hairs lodged in his cornea. 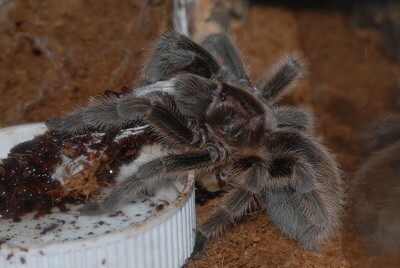 The hairs were thrown from the man's pet G. rosea while the man was cleaning its tank. Medical authorities urge owners to wear protective eyewear when handling a G. rosea. Keeping in mind that urticating hairs can cause medical problems, handling the tarantula is not a concern if handlers wash themselves afterwards and remain cognizant of the hazards. © Joseph Dougherty. All rights reserved. 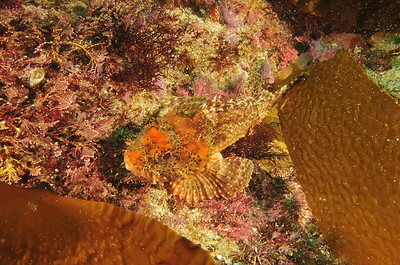 Scorpaena guttata Girard, 1854 California Scorpionfish aka Spotted Scorpionfish Channel Islands, CA. © Joseph Dougherty. All rights reserved. 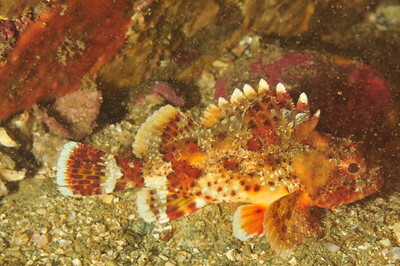 Scorpaena guttata Girard, 1854 California Scorpionfish aka Spotted Scorpionfish This is a juvenile, less than 4 inches in length. Channel Islands, CA. © Joseph Dougherty. All rights reserved. 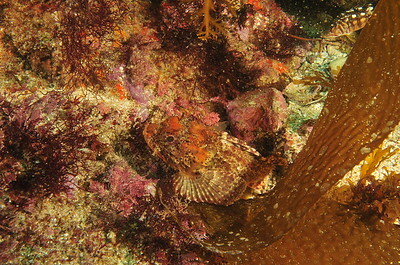 Scorpaena guttata Girard, 1854 California Scorpionfish aka Spotted Scorpionfish Can you see him? Hiding very effectively. 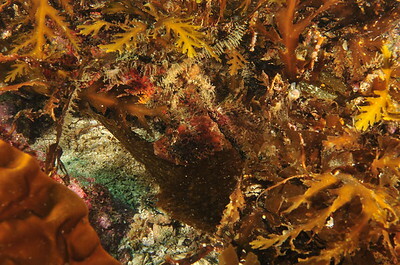 I only stumbled across him by accident while trying to take the photo of a different fish... the young kelp bass seen above. © Joseph Dougherty. All rights reserved. 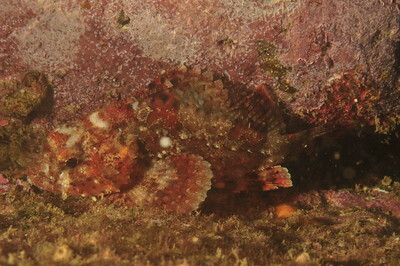 Scorpaenodes xyris (Jordan & Gilbert, 1882) Rainbow Scorpionfish Channel Islands, CA. Distribution:Eastern Pacific: California, USA to Peru and the Galapagos Islands. © Joseph Dougherty. All rights reserved. 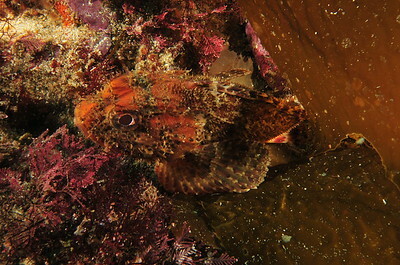 Scorpaena guttata Girard, 1854 California Scorpionfish aka Spotted Scorpionfish Channel Islands, CA. 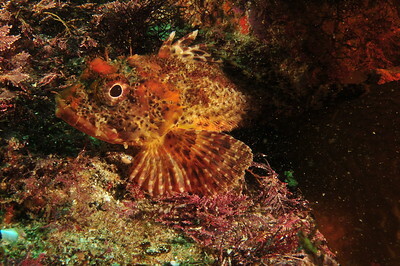 It is native to the eastern Pacific Ocean, where it can be found along the coast of California and Baja California. Its distribution extends from around Santa Cruz, California, to Punta Abreojos in Baja California Sur, and out to Guadalupe Island. 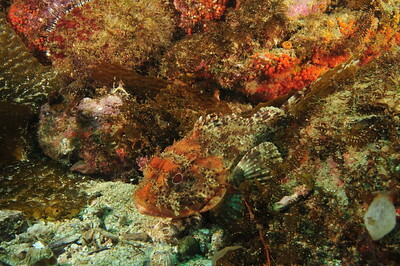 It is also found in the Gulf of California. © Joseph Dougherty. All rights reserved. 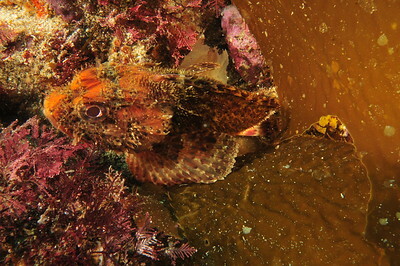 Scorpaena guttata Girard, 1854 California Scorpionfish aka Spotted Scorpionfish Channel Islands, CA. 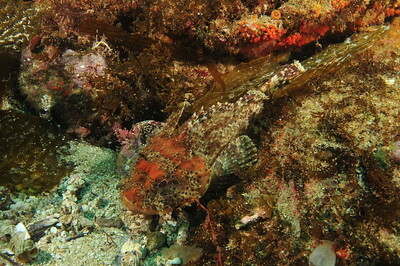 Like many other scorpionfish, this species has venom in its spines. 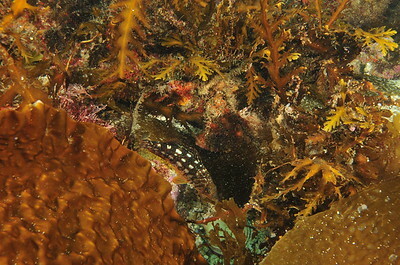 Once called "one of the most noxious marine animals in California waters," this fish has been responsible for many human injuries. 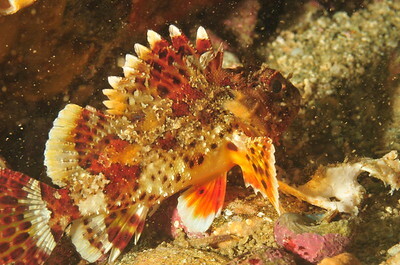 Fishermen are often affected when trying to remove the fish from a hook; when pulled from the water, the fish flares the spines on its fins and gill covers, making it difficult to handle. 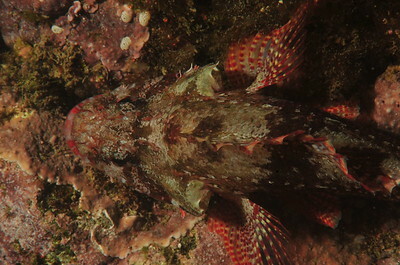 The spines themselves are sharp enough to inflict substantial wounds, but the venom can cause a number of additional symptoms. The pain of the sting issaid to feel much like a rattlesnake bite, though the systemic effects are not usually as dangerous. A spine prick to the finger was reported by one victim to cause a severe, throbbing pain and cyanosis of the digit, which became swollen and hard, then hot and red, then numb. Pain traveled up the arm to the axilla, which developed painful masses. Systemic symptoms included nausea and a feeling of faintness, and the skin was cool, clammy, and pale. In two weeks the victim had recovered. Another victim developed pericarditis from an envenomation. Each spine has two longitudinal grooves which are filled with epithelial tissue that contains venom-secreting glands. The spine is sheathed in a thin membrane. As the spine enters the victim, the membrane sheath is pushed back, helping to inject the venom into the victim. The venom is cardiotoxic, in laboratory studies producing fluctuations in blood pressure and EKG changes such as ventricular tachycardia and bundle branch block. © Joseph Dougherty. All rights reserved. Poecilothera regalis (Pocock, 1899) Indian Ornamental Tree Spider aka Indian Ornamental Tarantula Poecilotheria regalis is one of the most popular arboreal tarantulas. 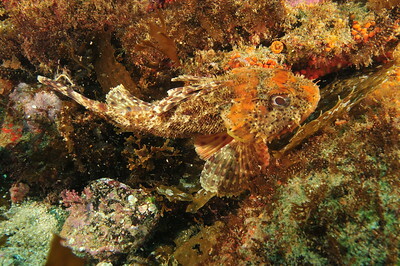 Their legspan sometimes exceeds 7 inches (18 cm). 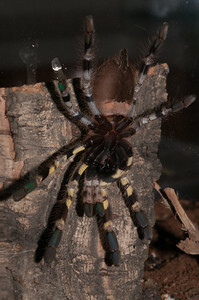 The P. regalis' behavior parallels that of many arboreal spiders. In the wild the P. regalis live in holes of tall trees where they make asymmetric funnel webs. Their primary prey consists of various flying insects, which they seize in flight and paralyze. It is not unknown for the spiders of this genus to live communally when territory, i.e. number of holes per tree, is limited. These tend to be quite aggressive spiders. Although there has never been a recorded death from any tarantula bite, this species is considered to have a medically significant bite, with venom that may cause intense pain and severe illness in sensitive or vulverable individuals. 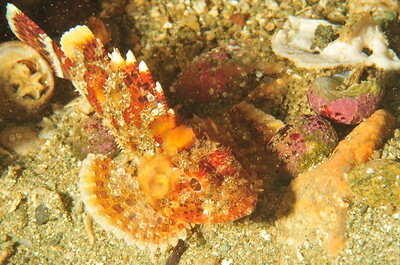 They move rapidly and may attack when cornered. The name Poecilotheria is derived from Greek "poikilos" - spotted and "therion" - wild beast. Regalis refers to "royal". This whole genus of arboreal tarantulas exhibits an intricate fractal-like pattern on the abdomen. © Joseph Dougherty. All rights reserved. 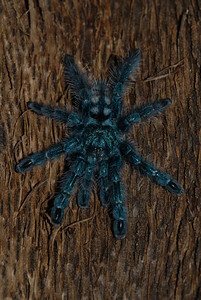 Poecilothera regalis (Pocock, 1899) Indian Ornamental Tree Spider aka Indian Ornamental Tarantula, , Regal Pokey Poecilotheria regalis is one of the most popular arboreal tarantulas. 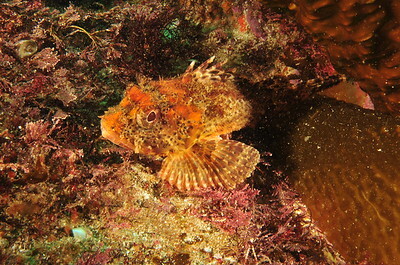 Their legspan sometimes exceeds 7 inches (18 cm). 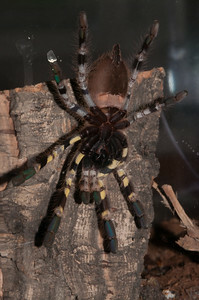 The P. regalis' behavior parallels that of many arboreal spiders. In the wild the P. regalis live in holes of tall trees where they make asymmetric funnel webs. Their primary prey consists of various flying insects, which they seize in flight and paralyze. It is not unknown for the spiders of this genus to live communally when territory, i.e. number of holes per tree, is limited. These tend to be quite aggressive spiders. Although there has never been a recorded death from any tarantula bite, this species is considered to have a medically significant bite, with venom that may cause intense pain and severe illness in sensitive or vulverable individuals. 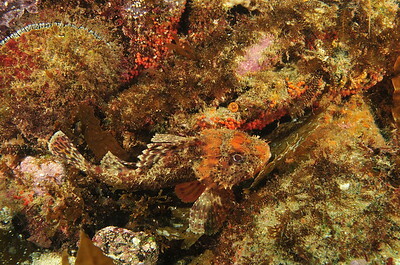 They move rapidly and may attack when cornered. The name Poecilotheria is derived from Greek "poikilos" - spotted and "therion" - wild beast. Regalis refers to "royal". This whole genus of arboreal tarantulas exhibits an intricate fractal-like pattern on the abdomen. © Joseph Dougherty. All rights reserved. Poecilothera regalis (Pocock, 1899) Indian Ornamental Tree Spider aka Indian Ornamental Tarantula, Royal Pokey These are arboreal spiders from southern India with grey, white, and black patterns on the dorsal side of the abdomen. 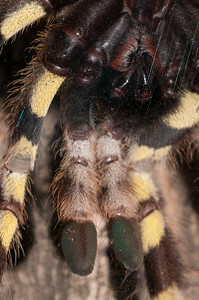 They have brilliant yellow and black "caution" bands on the undersides of legs I and II. Legs III and IV and the pedipalps have an alternating black and white pattern. The tarsi ("feet") are metallic blue-green and covered with fine hairs. There are 5 to 6 white spots on a black field on the tibia, and they are the only spiders in their genus that have a cream band on the ventral side of the abdomen. Legs I are very noticably larger than legs IV. In fact, the femora of legs I are fringed so heavily that they appear almost "cubic" in shape. The natural habitats of these and other "Pokies" is disappearing at an alarming rate due to human development of the natural range. Most live high above the ground in palms and other tropical foliage. © Joseph Dougherty. All rights reserved. Poecilothera regalis (Pocock, 1899) Indian Ornamental Tree Spider aka Indian Ornamental Tarantula, Regal Pokey Poecilotheria regalis is one of the most popular arboreal tarantulas. 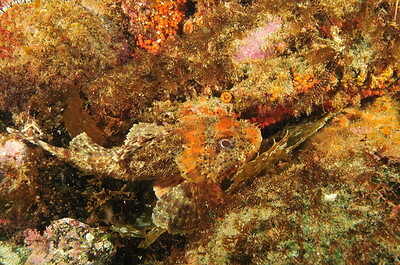 Their legspan sometimes exceeds 7 inches (18 cm). 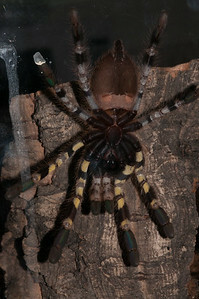 The P. regalis' behavior parallels that of many arboreal spiders. In the wild the P. regalis live in holes of tall trees where they make asymmetric funnel webs. Their primary prey consists of various flying insects, which they seize in flight and paralyze. It is not unknown for the spiders of this genus to live communally when territory, i.e. number of holes per tree, is limited. These tend to be quite aggressive spiders. Although there has never been a recorded death from any tarantula bite, this species is considered to have a medically significant bite, with venom that may cause intense pain and severe illness in sensitive or vulverable individuals. 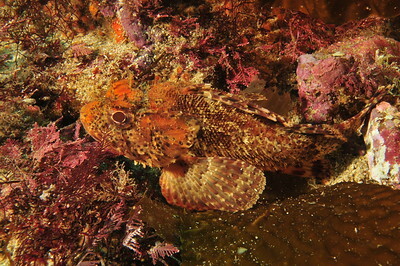 They move rapidly and may attack when cornered. The name Poecilotheria is derived from Greek "poikilos" - spotted and "therion" - wild beast. Regalis refers to "royal". This whole genus of arboreal tarantulas exhibits an intricate fractal-like pattern on the abdomen.